Equipped with features like 7 inch high quality screen, Android 4.0.3 ICS OS, Micromax Funbook Alpha price in India is Rs. 5,999 (best price) for online. Micromax Funbook Alpha price for retail store is Rs. 6,499 only which is also its official MRP. Micromax Funbook Alpha features and specifications include 1GHz processor and 4GB internal memory for fast performance, 0.3MP primary for average quality of photography. Micromax Funbook Alpha price truly make it budget tablet in Indian market but with good quality features which makes it highly suitable for entry level professionals and students. Micromax Funbook Alpha features 7 inch screen with 800x480 pixel resolution with TFT LCD quality which will make user experience not only smooth but highly productive. Micromax Funbook Alpha has 1GHz processor and internal memory of 4GB which is quite appropriate to provide seamless user experience while working on light to medium applications. Music player: MP2, MP3, WMA etc. Micromax Funbook Alpha specifications include Li-Ion 2800 mAh battery which provides talk time of 5 hours and stand by time of 9 hours which is slight disappointment as it will require frequent recharge. The tablet is available suave silver color model and very light weight which makes it easy to carry easily anywhere. 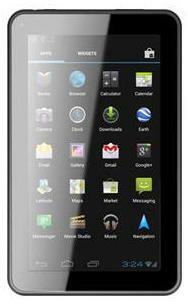 Micromax Funbook Alpha price is truly one of the main attraction of this tablet. It's features especially for screen, processor, memory are quite adequate to serve all basic needs of day to day applications.